With 2018 winding down, there’s only ONE MORE MONTH to enter Elfquest’s big 40-year anniversary treasure drawing. What could you win? The Elfquest Treasure Box, a one-of-a-kind trove of rare and wonderful EQ collectibles gathered by Wendy and Richard Pini for this one-of-a-kind celebration – out-of-print books, posters, portfolios, ephemera, merchandise – plus the very last character head sketch Wendy will ever do (at least for this year). So how do you enter? 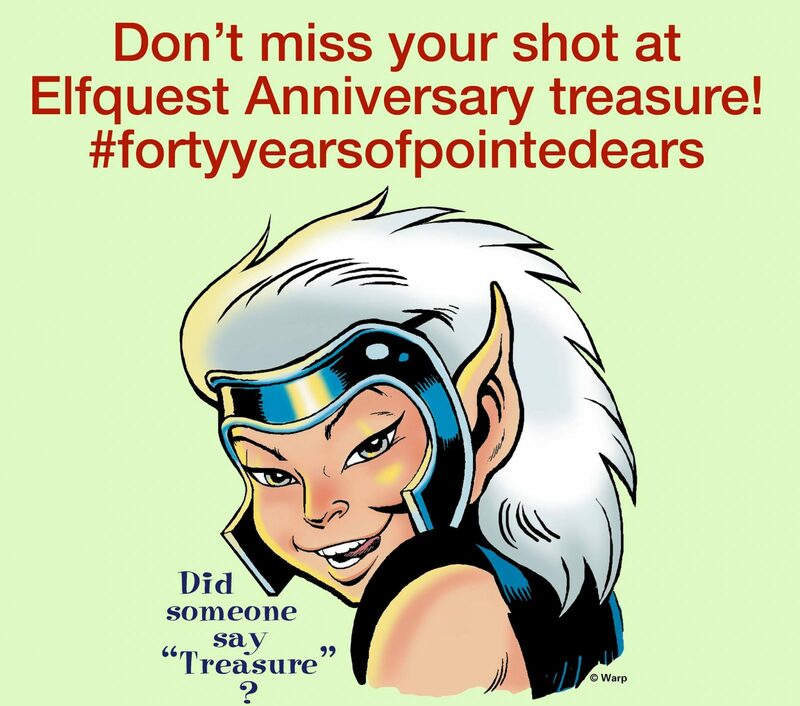 Easy – just post an Elfquest-related photo or message to your public social media – Facebook, Twitter, Instagram – using the hashtag #fortyyearsofpointedears. Take a selfie of you holding Elfquest books or wearing an Elfquest t-shirt, show off your own fan art or cosplay, sneak a photo of your friend or child reading EQ. Be creative! It’s acceptable to repost other people’s photos but we want to know what Elfquest means to YOU as a READER, not just a collector. Every post you make is automatically entered into the database from which, on January 2, 2019, we’ll randomly draw the winner. So what are you waiting for? The countdown clock is ticking… #fortyyearsofpointedears FTW!